We achieve our unique point of differentiation by making all our garments in printed fabrics with our own exclusive designs. 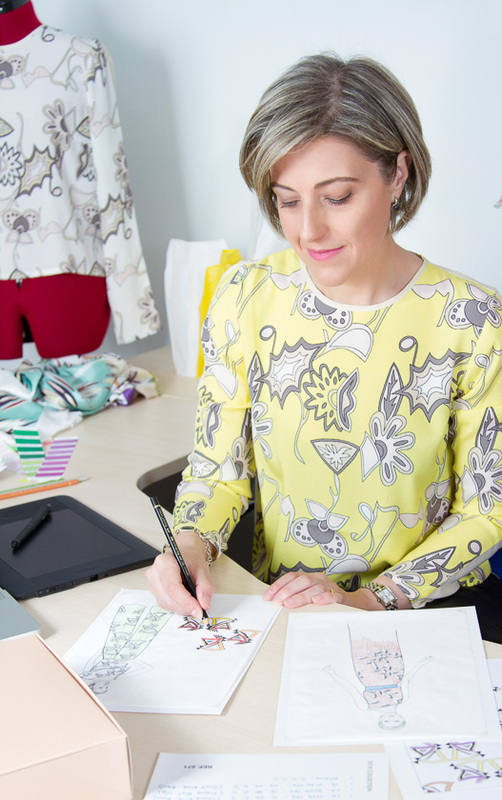 Alba LAZARÍ creations are recognizable by our hallmark, original prints, created by designer and brand founder, Alba Rodal, who conceives each design as if it were a small artwork. The prints are an expression of her unique and original style which confers exclusivity to each creation. Creativity is inherent in the design of each Alba LAZARÍ garment, a fusion of inspiration, technical knowledge and a long creative process, from the original sketches to the finished product. Each Alba LAZARÍ creation is made in a traditional, artisanal way by a team of professionals with a real passion for their work, taking care of every detail and once finished undergoes exacting quality control to verify it meets the demanding standards of our brand. Each season, we offer a collection with our exclusive prints in enchanting palettes highlighting the seasonal trend colours. At Alba LAZARÍ, women are our inspiration. Our aesthetic is elegant and feminine, with a classic and timeless silhouette for women who are seduced by elegance, who dress well and seek specially designed creations. Woman who like to feel attractive, while maintaining their own essence. The Alba LAZARÍ woman is bright, feminine, versatile, independent, confident and sensual. She is sophisticated and has her own distinctive style, a result of her innate elegance and knowledge. Each garment is the result of a meticulous and careful creative process. All the designs of Alba LAZARÍ are the expression of our original style. After many weeks of work, the hand drawn prints, colours and lines originally sketched on paper are transferred to the PC where the final, precise and detailed work is completed to bring the concept to the final print. Once the design is finished, it is printed to test the colour reproduction and quality with the chosen fabric. After the printing tests are completed and the best results achieved, the designs are printed on the chosen fabrics. From the first meters of printed fabric will emerge our first samples and prototypes. The patterns for our clothes are made by an artisan atelier and during this process we adjust the designs for the best fit and look and make decisions about finishing details such as linings, buttons and so on. At Alba LAZARÍ we design all our own prints, meaning they are exclusive – only available from Alba LAZARÍ. Our designs are printed on high quality fabrics that we carefully select. All our garments and accessories are made in a traditional and artisan way, ensuring quality excellence in manufacturing and finishing. 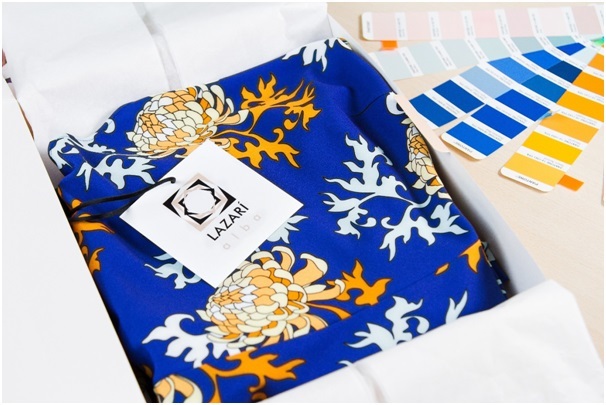 Each Alba LAZARÍ garment has behind it a creative and artisan process amounting to many months of work. We are proud of each and every one of our creations; each is a small work of art in itself, an exclusive design with a unique value. A high level of quality control is present throughout the whole process, from the initial test prints to the final finishing of the garments. Our creations are produced in an artisan way by a team of professionals that take care of all the small details that add value to our garments. Each item under goes an exhaustive quality control to verify it meets Alba LAZARÍ demanding standards ensuring quality and excellence. At Alba LAZARÍ we design all our own prints, meaning they are exclusive – only available from Alba LAZARÍ. Our designs are printed on high quality fabrics that we carefully select. All our garments and accessories are made in a traditional and artisan way,ensuring quality excellence in manufacturing and finishing. Alba LAZARÍ is more than a brand that gives name to the creations of designer Alba Rodal. The LAZARÍ surname stems from the Italian origins of her mother’s family, established in Spain for many generations. Alba Rodal, the founder and designer behind Alba LAZARÍ has always immersed herself in the arts. After graduating in Fine Arts she completed an MA in Textile Design and Technology followed by formal training in Graphic and Interior Design. In addition to a solid artistic education and ample experience with prints, art, interior design and fashion, Alba also has an exquisite feel for colours, a devotion to detail and a sure sense of what many woman desire: a feminine elegance. Her career has always been linked to artistic creation and following her work as an interior designer she established the brand Alba LAZARÍ in 2014 to offer women premium and exclusive garments produced in a traditional artisan way. Alba Rodal elaborates every design as if it were a small work of art. Her creations are recognizable by unique, perfectly colour co-ordinated designs and exclusive prints created by her and influenced by different artistic disciplines such as architecture, film and painting. Alba combines the sights, sounds and sensations she gains from her travels around diverse countries of Europe – countries that together are a source of inspiration for her – with artistic knowledge and personal taste into her original and unique designs.